With Apple's new fingerprint recognition, "Touch ID", for the iPhone, one of the problems they'll have to deal with is that your fingerprints can change. I experienced this when I was a kid by sticking my finger into a "router", a device that shaves off the corners of wood to round them. 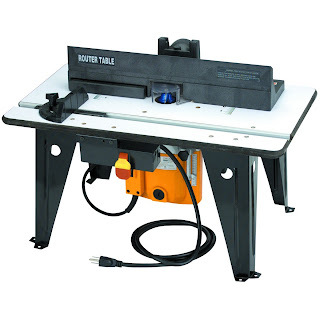 This (picture on right) is what a router table looks like. You push the wood left-to-right, and the rotating bit in the center shaves the wood, to make rounded corners, or other corner shapes. As I was pressing the wood against the fence, and moving it along, the router bit struck a knot in the wood, kicking it out. Because I was pressing forward at the time, I pushed my finger into the bit. Luckily, I pushed hard. The bit caught the bone, stopping the bit, and kicking my hand back out. This mean I got only two deep cuts into the tip of the finger (and a sprained finger) rather than having the flesh completely removed. Here's what my finger looks like today. The white parts are smooth scar tissue, and you can see the ridges on either side don't quite line up with each other. I'll have to try it with the iPhone and see if it recognizes this as a finger. By the way, it didn't hurt. I didn't feel a thing. I logically reasoned that since my hand was violently kicked from the device, in a direction opposite from the wood, what must've happened. I clenched my fist and ran out of the garage calling for my mother to take me to the hospital. I then went to run it under water, at which point I was surprised at how little blood there was. This was over Labor Day weekend. The room was filled with guys with accidents during home projects. One guy was jacking up his house, which fell on his hand crushing it. Another guy cut backwards up his hand between his two middle fingers, separating his hand nearly in half. My injury was of far lesser importance, so I had a long time to wait. Eventually they put me in a room and had me stick my finger into a glass of iodine solution to disinfect it. I don't know why iodine, but it was puce colored liquid. I never really hurt until the doctor injected Novacaine around the base of the finger. Those injections where unimaginably sharp pain -- though presumable still better than the pain of sewing up the tip. The number finger was worse than the pain. I couldn't feel it, and that bothered the heck out of me. That was the most "emotional" part of the whole experience, sitting there with my finger sticking down into the glass of iodine, invisible and numb. The doctor created a sterile field with a cloth with a hole in the center to stick my finger through. I watched him sew up the finger with morbid fascination. Sewing things up like this always leaves a "pigs ear", which he snipped off. That bothered, because that was MY flesh he was discarding. They gave me codeine or something the for the pain, but it was never really painful after words. I had to hunt-and-peck type for about a month with gauze on my finger. It was quite a long time later (in my memory) that I went back to take the stitches out. Again, it was quick sharp pain as he grasped each stitch and pulled it out. I think there were 7 stitches in total -- quite a large number for such a little cut. For about 5 years after, my finger would hurt when pressed hard against something, because of the stiff scar tissue that went clear to the bone. I did finish the project, a CD holder, but then through it out a few months later, because it sucked. I'm going to guess that you can override it by entering the password. It will probably require a password the first few times until it is comfortable recognizing your finger, and then skip the password when its not needed. As for changes over time, continual monitoring of the different fingers will track the changes. Just guessing, but it'll be doable. 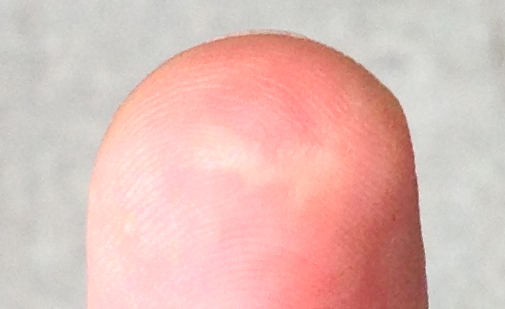 Thanks for the picture of your password^W finger. "through it out" --> "threw it out"